We are an indie game development studio currently looking for a highly skilled pixel artist(s). You would be required for a variety of pixel art work on an indie game that is currently in development. We require that the pixel art must be very high quality with a focus on detail and environmental atmosphere. The game represents gameplay and visual inspiration from old school top down adventure type games such as Zelda A Link To The Past / Zelda Minish Cap, Secret of Mana/ Secret of Evermore, Chrono Trigger, Terranigma, Illusion of Gaia, Legend of Oasis, Alundra. We are looking to create an art style personality that is more high detailed/quality then the games listed above. Please look over these game's art styles before applying. I often receive applicants who send me emails with little to no work to show of this type. I need to see actual work that can prove they can handle this art style. Providing as much information as possible in your initial email is very helpful at helping when responding. We are looking to hire an artist who specializes in Tile Sets. I cannot stress how important to us to find a pixel artist who can achieve the style required for our tile sets. 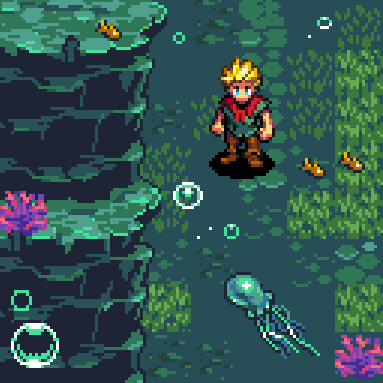 I would even prefer a pixel artist whom can be completely dedicated to making tilesets for our environments. This could also include backgrounds if needed for certain maps. Tilesets will also need animated features for the map to help bring the environment to life. Shown below is an early mock up of an area from one artist who I worked with for a little while. Currently we have been working with 32x32 for our size. This reference is mostly to show an idea of map art style and character sprites. This game is going to be quite large, we have planned at this point roughly about 6-7 Worlds, which will contain a large number of maps per world. This is going to require a large number of Tilesets, which is why I'm looking for a specific pixel artist to handle tile sets. You can expect lots of work, so discussing payment is important as hourly might not be the best approach. Still it is helpful if you can provide your rates hourly as well prices for combining many tasks into a "package price". I am also searching for a pixel artist who can handle sprite animation for both characters and monsters. If you can handle both that's even better but I would most likely prefer to have an artist who specializes in either sprite work or tilesets / scenery so they can focus on one only. Consistency is key here so please include your work experience and ability to handle different types of work at the same time. Please send your application along with your rate and portfolio to our email below. As stated above, the more info/work provided the better! I promise to do my best respond within a timely manner but I appreciate your patience in hearing back, thanks!